SuretyGroup.com writes surety bond for septic service providers. Restrooms are a necessity of life, whether it’s in your home, at work, or even a port-a-potty at a big event. All that waste needs to go somewhere, and if you don’t have a properly working sewage system, it can be a big, smelly deal. When you need a septic professional, you don’t want to mess around. This is a job you want done right the first time by someone who knows what they are doing. Thank goodness for septic service providers — the guys who design, install, repair, maintain, operate and inspect septic systems, plus those who maintain portable toilets … what would we do without them? Many states and counties want a guarantee that these licensed professionals will comply with the laws and regulations, which include keeping the environment safe and clean. They may require a surety bond for this purpose. Each state or county has different licensing requirements and different bonding amounts. $15,000: Basic Installer, Manufacturer, Pumper, Portable Restroom. 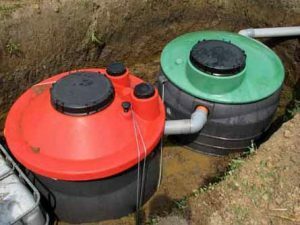 If you are in the septic business and need a surety bond, you must purchase it from a Surety through a licensed agent, such as SuretyGroup.com.